The Bear Creek trails we followed today were part of the primary route to the summit of Pikes Peak before the Pikes Peak Highway and Barr Trail were built. In the late 1800s, they took burros up the trail. Apparently, developers at one time had plans to build a hotel and opera house in Jones Park for all the Pikes Peak tourists. We started at the intersection of Lower Gold Camp Road and High Drive. High Drive is still closed to cars for the season. 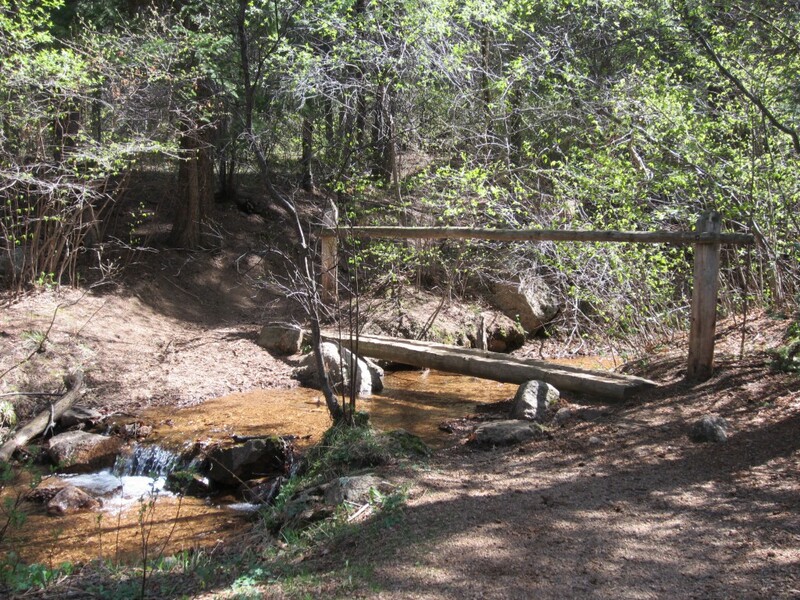 We followed Bear Creek along High Drive and the Bear Creek Canyon trail to Jones Park. From Jones Park we took a well-marked social trail past Louds Cabin up to a saddle between Mt. Garfield and Mt. Arthur. That trail from the cabin was steep! Mt. Garfield was our first summit; we spent about 30 minutes up there enjoying the views. Then we went over to Mt. Arthur. Then, we retraced our steps back down to the parking lot. Sometimes I think of the trees and wildflowers in the mountains like slow-motion fireworks, in the way that the different plants only bloom for certain parts of the year. I noticed today that some are starting to “go off”! Lesson learned: Do not trust the battery gauge on the digital camera. It showed a full charge, so I didn’t charge it overnight. Then, the battery ran out in the first 5 minutes of use today! So, I have no video. The battery only had enough juice for a few photos. Despite the camera problem, it was a big hike today. From the four-way parking lot in N. Cheyenne Canon Park, we started up Gold Camp Road and Seven Bridges trail to Jones Camp; then, up trail 668 to Nelson Camp; then, continuing on 668 and 701 to Frostys Park (no gunshots today); then, up the west (back) slope of Mount Rosa on trail 672 (Nelsons trail) to the summit of Mount Rosa (11,499′). For the descent, we took trail 672 down the east (front) slope of Mount Rosa; then trail 624 through Buffalo Canyon, past St. Mary’s Falls, and back to Gold Camp Road and the 4-way parking lot. Whew! Trails 668 and 701 from Jones Camp to Nelson Camp to Frostys Park are degraded by the use of motorcycles. (It is a legal multi-use trail.) There is a great deal of loose gravel and erosion. If and when I hike this route in the future, I will be sure to start early (as I did today) in order to avoid dirt-bikes. Today, we started at 6:00 AM, and did not encounter a single person until we were on our way down from Rosa. It took us about 4 hours to reach the summit by our chosen route. I wore the microspikes for the last 400′ of elevation gain, due to the amount of snow still on the north-facing slopes. It seemed odd to have snow-gear on my feet, while wearing only a t-shirt on my upper body. I guess that’s Colorado for ya! The summit of Mount Rosa was the highlight, for sure. 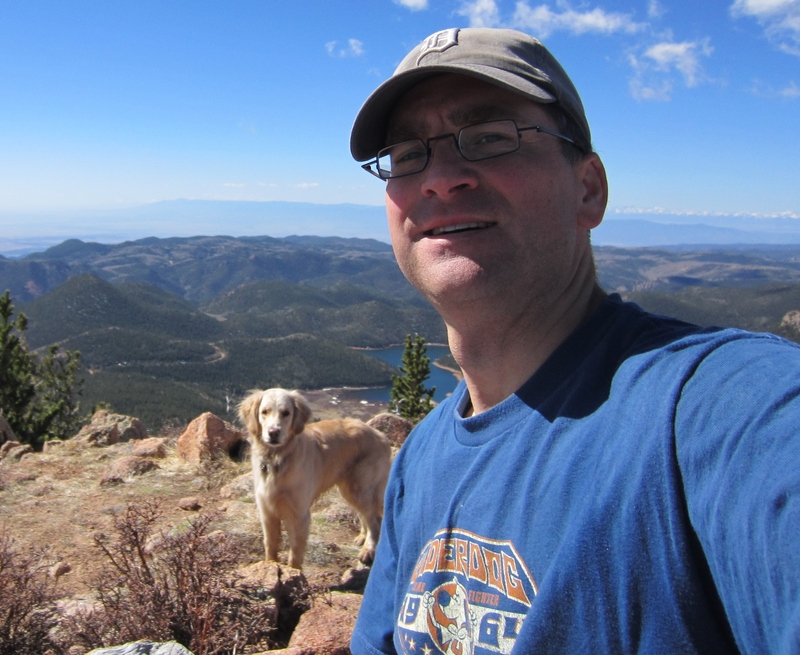 At the summit, it was warm, dry and sunny, with no wind–perfect conditions for lingering and enjoying the great view. We could see south all the way to the Spanish Peaks (near Walsenburg) and west to the Collegiate Peaks (near Salida and Buena Vista). The Sangre de Christo range (near Westcliffe) was like a postcard with its snowy peaks. 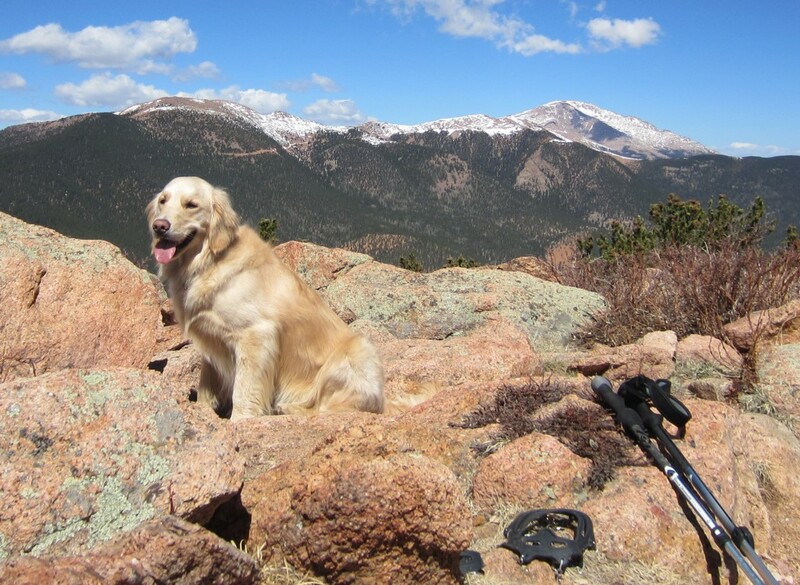 Almagre Mountain and Pikes Peak loomed large to the northwest. 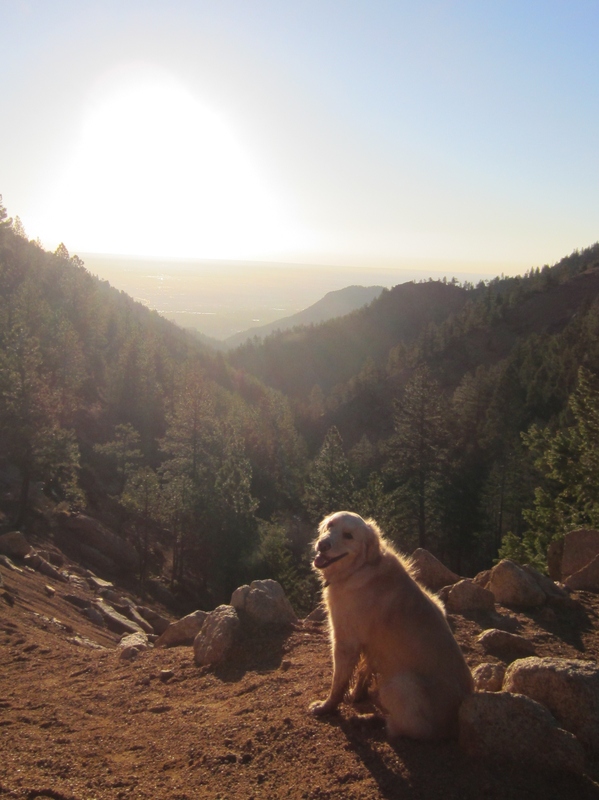 Cheyenne Mountain and Colorado Springs appeared down below to the east. On the way down, we walked through Buffalo Canyon. I bet the canyon is named after the great amount of buffalo grass that grows there (just a guess). Before St. Mary’s Falls, we met only two groups of hikers the entire morning. After St. Mary’s Falls, we met with hikers, runners and mountain bikers every 5 minutes or so. 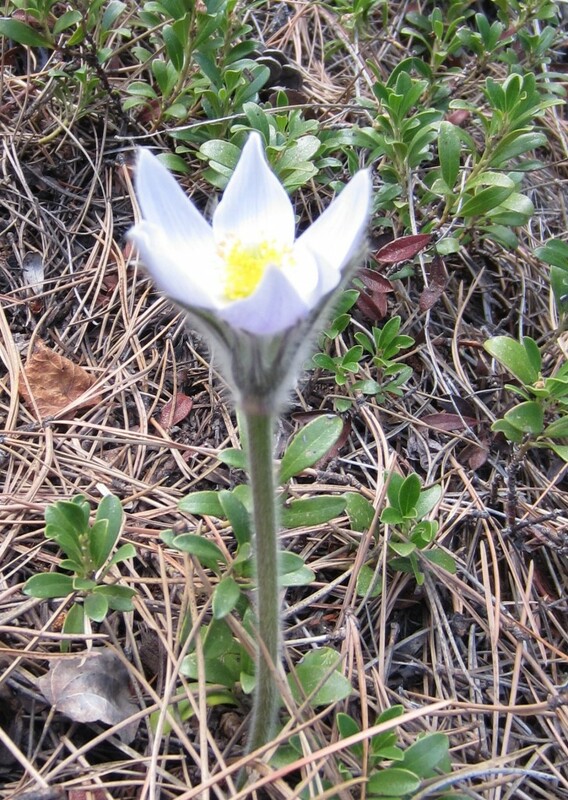 I also saw my first wildflower of the year, a Pasqueflower. We got back to the car just as rainclouds started to roll in over Cheyenne Canyon. What good timing! We could have worn shorts today, it was so nice out. 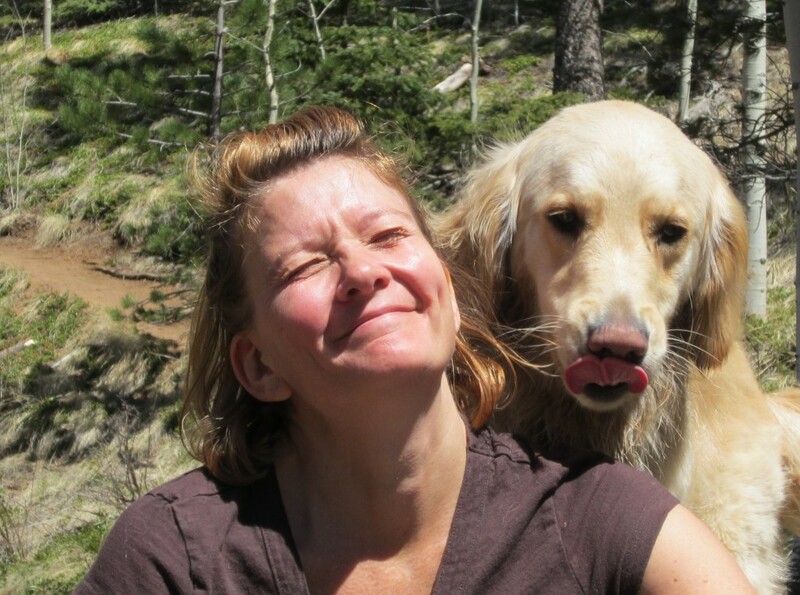 The weather was sunny with no wind–a great day for a hike. I took Michelle up the Seven Bridges trail to Jones Park. We stopped for lunch there, and took the same route back. We had no snow on our trail, but it looks like there is still some snow up at about 11,000′ and higher. The trees and bushes are budding, but still no leaves on the Aspens. As the weather is getting nicer, we are seeing many more people out on the trail.